Nothing like capturing an intimate moment. Here we have a honeybee gettin' busy and bedazzled with a flower that looks like it's giving us rays-of-the-sun realness. Rich yellow color. Stigmas looking like sun beams. Nature in its finest hour. But wait. Something super-fantastic-crazy-cool is going on behind the scenes. 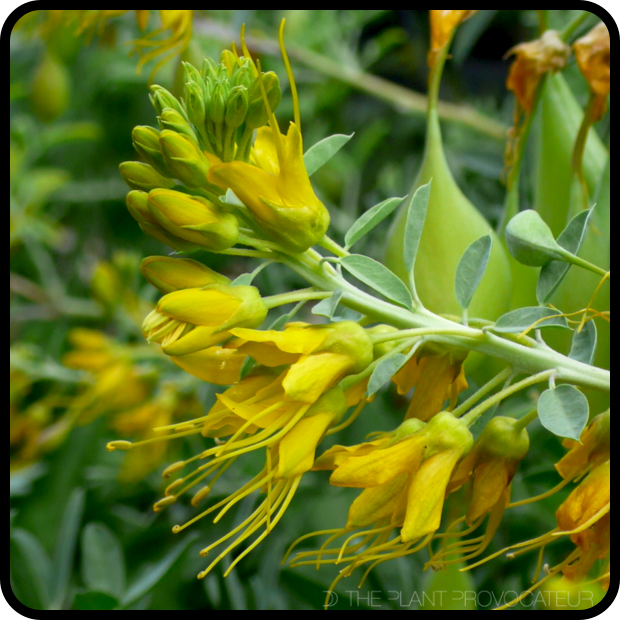 Let me introduce you to one of California's finest native shrubs, Peritoma arborea. Peritoma arborea is a multi-stemmed evergreen shrub that gets to be about 3 - 6 feet tall and wide. From late autumn through midsummer, it produces inflorescence of strong, exuberant yellow flowers rich in color and ornament. So beautiful and energizing. Yet, that's not the end of the show from this California native. As the flowers fade, this shrub's excitement takes on a different form. A bizarrely, captivating form that makes it seem like a plant from another world. Flowers fade and its strangely, surreal 2 inch pods that take over. 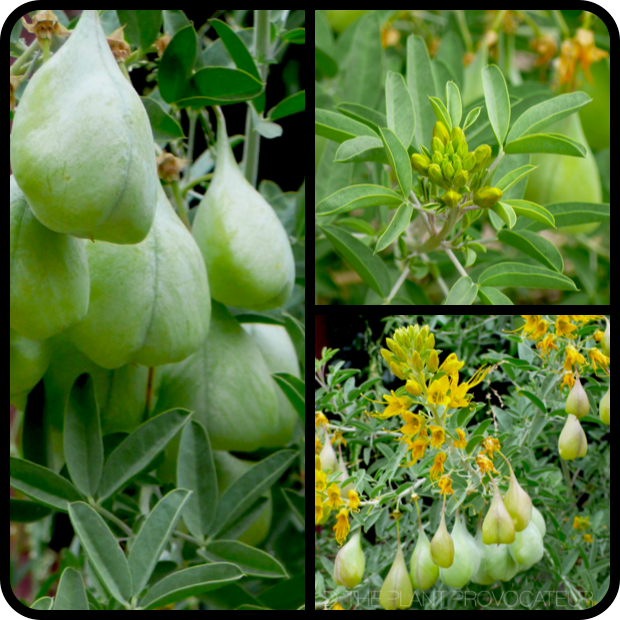 These balloon-like pods give Peritoma arborea its rousing common name of Bladderpod. Small seeds are held in these pods. As they mature, they provide the pods with a rattling sound. These puffy, inflated pods remind me of overgrown packing bubbles when squeezed and popped. Pretty cool. The other great thing about Peritoma arborea is that its flowers provide rich nectar nourishment to hummingbirds, bees, and butterflies. It's also a pretty tough customer when it comes to harsh elements such as drought and deer. If things are too dry it can go deciduous to survive a spell and deer are not fond of the foliage. To grow Peritoma arborea give it full sun, average soil, and low water. It's hardy down to 0 degrees fahrenheit/-17 degrees celsius. This is one California native that I'm crazy about. It's the perfect plant for keeping the wilderness weird and wonderful. Blooms just about year round, adorns itself with bizarrely beautiful seedpods, and is as tough they come. Get it! Grow it! Know it!